June | 2013 | YesBiscuit! Dignity: You’re doing it wrong. On Tuesday evening, the city council will discuss whether to include a $50,000 crematory at the Farmington Regional Animal Shelter. In addition to being more humane, the crematory will pay for itself in two years, [city manager Rob] Mayes said. Win for everybody! More dignified and cost effective! I can’t see any possible drawbacks. Unless anyone wanted to consider that pets at the Farmington pound have a right to live, that there is no dignity in killing shelter animals, and that $50 grand could go a long way toward saving lives. But no. Wendy has a bladder infection and had to go to the vet to get checked out today. Wendy was shot at some time prior to arriving at the pound. 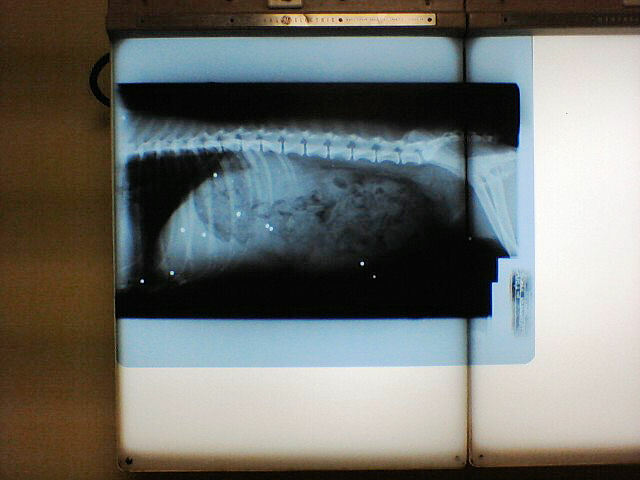 The white dots are small game shot she has lodged throughout her body. She was displeased with the visit and engaged in civil disobedience on the ride home. 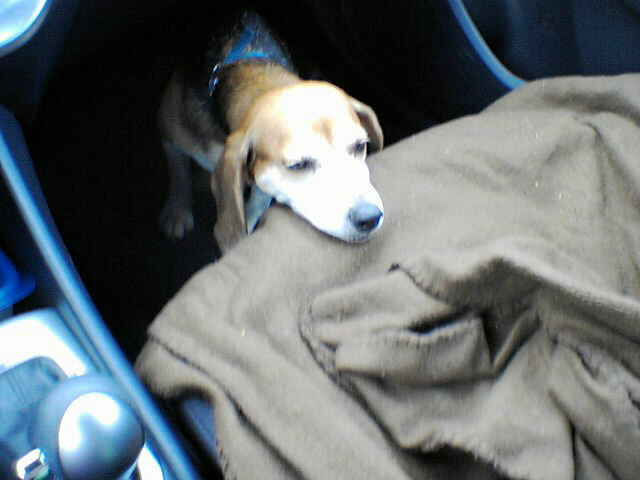 I refuse to lay on the soft blanket provided for me on the seat. I will however use it as a head rest while sitting defiantly in the foot well. An incoming police chief in NC was responding to a dangerous weapon call at a home when he encountered a dog and owner. The officer shot the owner in the leg while reportedly attempting to shoot the dog. He then left the victim while he made a call on his cell phone. 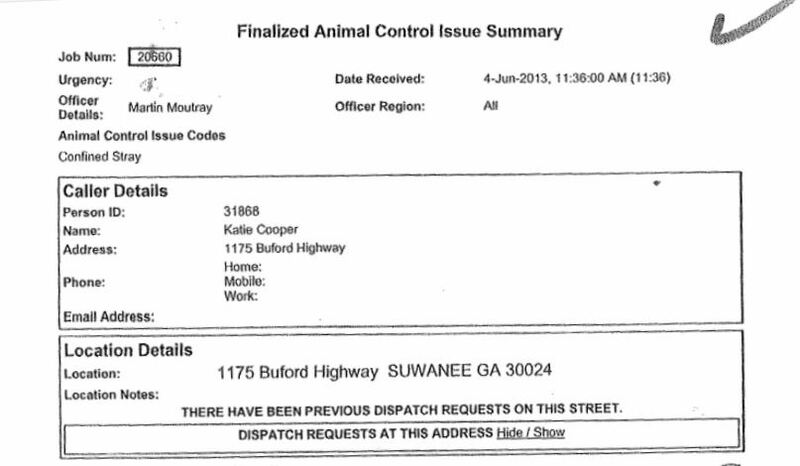 The dog has been impounded by Forsyth Co AC. Bobcat fever, spread by American dog ticks and lone star ticks, can be fatal to domestic cats. Feathers as a pet food ingredient and the possible dangers for pets with kidney problems. In 2011, I reported on the Halifax Humane Society (HHS) in Daytona Beach, FL when plans were announced to remove the overnight drop off cages from the facility. The executive director was tired of people who needed to surrender pets successfully dodging the staff’s lectures and finger wagging that took place during normal business hours. Now, more bad news in the HHS customer service department. This was at noon Wednesday; they euthanized him at 5:45 that evening,” Klem said. The humane society said Stick’s lost dog report was filed incorrectly, which is why no one knew his owner was looking for him. Our role. Dude, what? The implication that there were other roles involved in the killing of Stick is offensive. HHS killed Stick. Full stop. If you can’t own it, maybe you shouldn’t be doing it. Klem is asking the shelter to make changes by posting pictures of lost dogs on Facebook and on their own website. I would ask that the Halifax Humane Society not only post photos of every pet in the facility upon impound – a simple lifesaving tool that every pound should use – but also that they stop killing pets. A dog wearing two collars is someone’s pet. A person filing a lost dog report with your facility is your customer. Do your jobs. 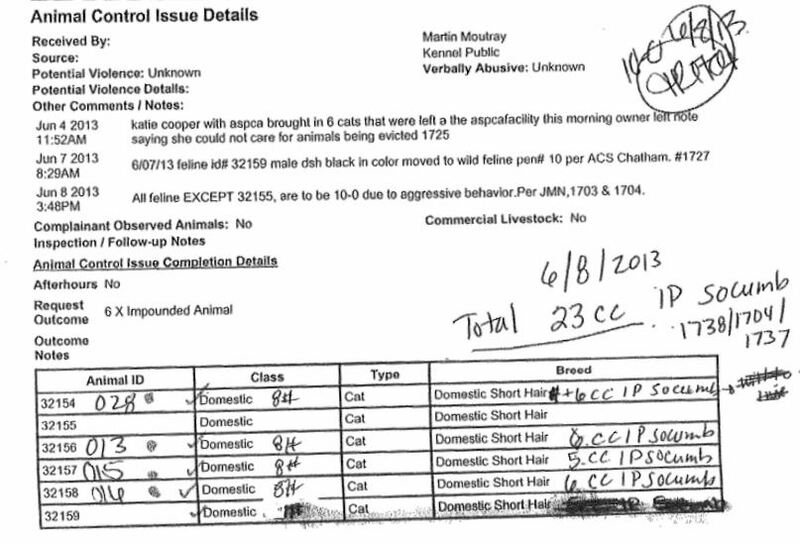 The cage card for dog #255016 indicates a 5 month old female Pitbull, owner surrendered to the Memphis pound on 6-1-13. The memos for the dog indicate a 1 year old female Lab mix, brought in as a stray by a Shelby Co ACO. I guess the pound is too busy killing animals to bother keeping records straight. The dog was apparently healthy overall except for intestinal parasites which are common and easily treatable with medication. MAS vaccinated her, tested her for heartworm (she was negative) and noted she was “very friendly and wiggly”. On June 7, MAS killed her because her time was up and they needed the space, according to the memo. Bear in mind this is a $7.2 million facility with plenty of empty cages at all times. The memo also notes that no one had requested any holds be placed upon the dog. She was never marketed for adoption by MAS to the best of my knowledge. There are no notes indicating a single rescue group or foster home was contacted by MAS in an effort to save this dog. 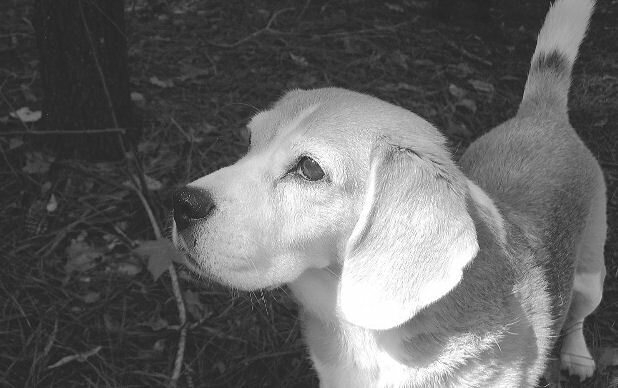 This dog’s records, obtained via FOIA request, are all that remains of her brief time in this life. How many more friendly, wiggly pets will be sent to the landfill on the taxpayer’s dime in Memphis? How much longer before someone takes a stand and demands that the MAS staff start doing their jobs? If you can’t be bothered to even try to save a wiggly puppy, you have no business working in a shelter. You are worse than useless, you are an enemy to shelter pets. And the same goes for all the enablers who look the other way, toe the company line and attempt to justify the needless killing at MAS. Shame on all of you. OMG! These two should totally be friends! [Kern County Animal Control Director Jen] Woodard reported that the county has had to put down 18,708 dogs and cats so far this fiscal year — or 63.9 percent of the 29,278 dogs and cats taken in since July 1, 2012. That’s a higher kill percentage than the county’s six-year average of 62.46 percent. [T]he person who brings the cat in will be given a voucher or some other resource to spay or neuter the animal and will be encouraged to release it where it was picked up. If this is the plan, I don’t see it as resulting in the humane reduction of the feral cat population over time. It requires the trapper, who may consider the cat a nuisance animal whom he doesn’t want around, to schedule an appointment for surgery, keep and care for the cat until the appointment day arrives, drive the cat to the clinic, pick the cat up after recovery and release him where trapped. While it’s certainly possible that some people might complete these tasks to help a feral cat, I think the more likely scenario is people opening the trap door in the shelter parking lot after being turned away. Or worse. I wonder if Kern Co couldn’t take on the responsibility for neutering and returning feral cats to make sure it’s done – and done humanely. But they would need to make cats’ and dogs’ right to live their priority. And based upon the horrifying number of shelter animals being killed in Kern Co this year, that doesn’t seem likely under current management. Natura Pet Products has recalled kibble and treats under the brand names Innova, EVO, California Natural, Healthwise, Karma and Mother Nature due to risk of Salmonella. The recalled products have expiration dates prior to June 10, 2014. Worth Co AC seized 30 dogs from a home in Georgia citing filthy conditions and dogs with mange and bacterial infections. They killed 25 of the dogs after veterinary evaluation. The owners have been charged with animal cruelty. Pets are family: Canadian kitty swims for her life in flood waters with the owner right behind her. CBS News catches up with the OK tornado survivor whose dog was found beneath rubble on live television. Researchers argue about when dogs were domesticated. 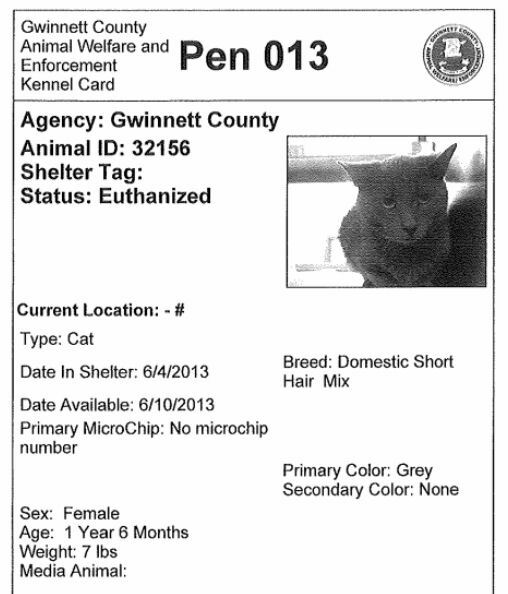 On the morning of June 4, a pet owner in Gwinnett Co left six cats at the Georgia SPCA with a note explaining she could no longer care for her pets as she was being evicted from her residence. Someone from the Georgia SPCA immediately brought the six pets to the Gwinnett Co pound. 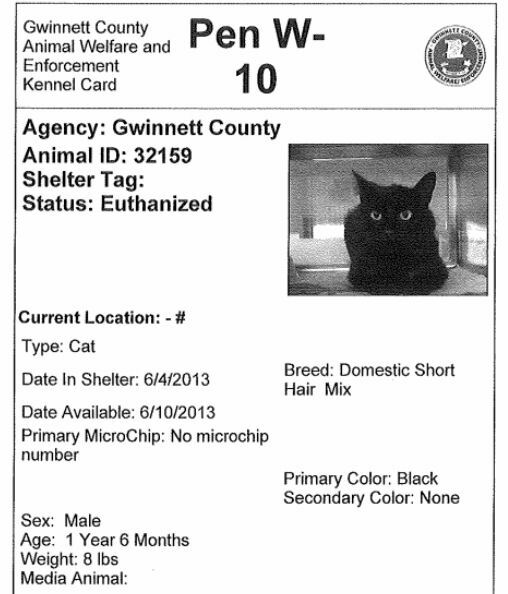 I requested records from the Gwinnett Co pound for five of the six cats after receiving a tip from a reader. 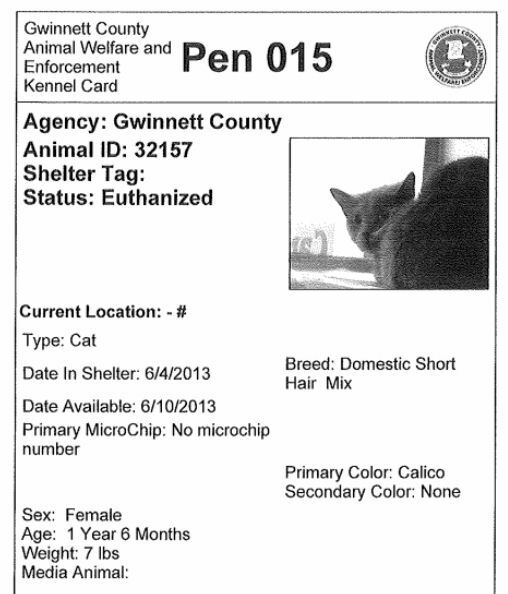 The address shown in the records below is that of the Georgia SPCA. There is a note indicating there have been “previous dispatch requests” at this address. 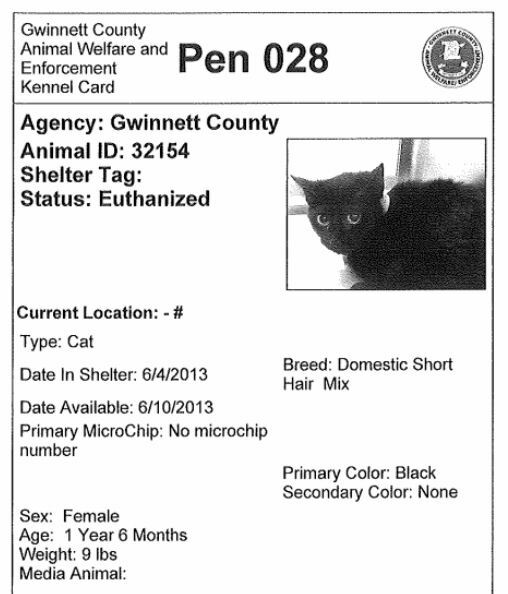 Portion of animal records from the Gwinnett Co pound in Georgia. All five cats were apparently young and healthy. They were held until their “available date”, June 10, then killed for “aggressive behavior” including one cat whose head was cut off and submitted for rabies testing after scratching an animal control officer. The rabies test result was negative. These were young, healthy pets, not “wild” cats and even if they had been truly feral, they had a right to live. 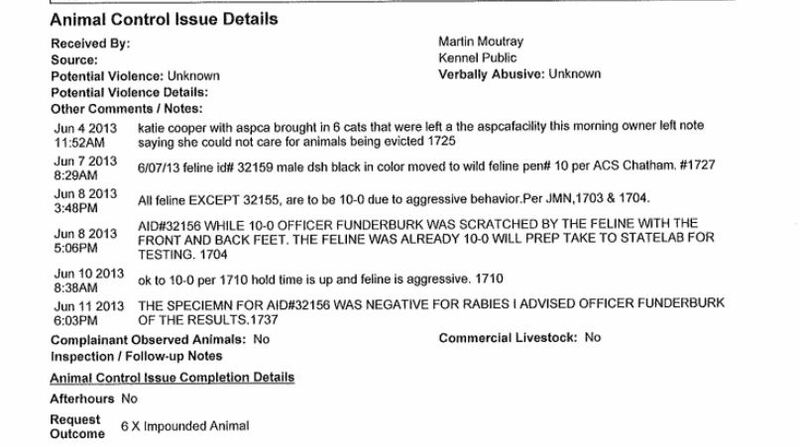 Someone being evicted from her residence was obviously desperate for help when she opted to leave them at the Georgia SPCA instead of taking them to the local pet killing facility. 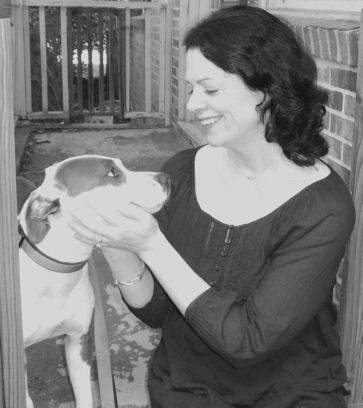 As a no kill organization, all animals accepted by the Georgia SPCA are placed in an adoption center or foster home until suitable homes can be found. 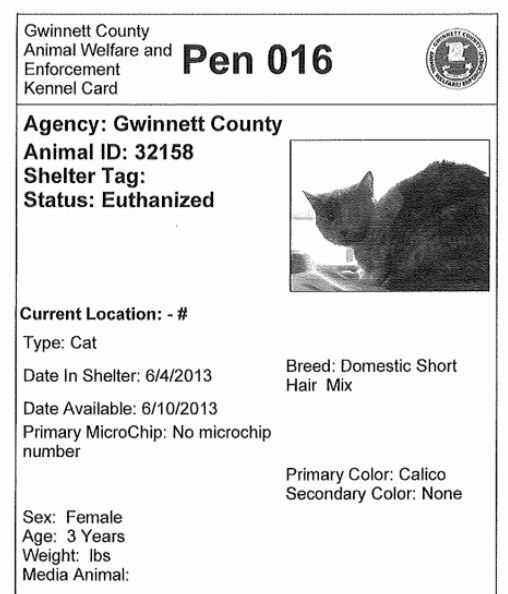 How does a person go about surrendering a pet to the Georgia SPCA? What does the Georgia SPCA do with pets left at the facility during times when the business is closed? It is illegal to abandon animals at our facility or any facility. If you have an animal that you need to surrender you can call the center to see if there is space. You can also go to http://www.petfinder.com and search for other no kill shelters that might be able to accept your animal. This isn’t the first time I have been contacted by people disillusioned with their local limited admission no kill shelter after learning they sometimes take pets to the pound. A limited admission facility generally makes it clear to the public that they do not have the resources to accept every pet in need. The Georgia SPCA however does not make this clear on its website or in its brochure. In fact, I did not see the words “limited admission” anywhere on the site nor did I find anything to indicate that pet owners in need can or can not bring their pets to the Georgia SCPA. I further failed to see any suggestions, advice or other information devoted to helping people who can no longer care for their pets. So how is the average local pet owner to know what to do to help their animals in need or that pets left at the Georgia SPCA, or any limited admission shelter, may not have their right to live respected? Does a facility which describes itself as “no kill” have any obligation to protect pets left at its door, even if the surrendering party did not go through the group’s regular procedures? 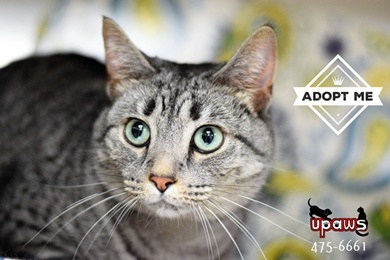 Is it appropriate for staff to immediately take pets left at a limited admission shelter to the pound? Do we simply lay the blame at the feet of the so-called irresponsible public and wash our hands of the matter because it’s a complex issue with no easy answers? Weigh in with your thoughts. Two more sad stories about police entering private property and shooting the dogs who live there. In El Monte, California, police entered a family’s yard through a locked gate which contained a “Beware of Dog” sign. Two dogs approached and one of the officers went back outside the gate and re-locked it. The officer still inside the yard shot one of the dogs. The 2 year old dog suffered for an hour until AC arrived and brought the injured dog to a vet. The vet told the family the cost to save the dog would be $8000 and since the family was unable to pay, the dog was euthanized. There is video of the incident at the link.